A single SILVER CANDLESTICK from Switzerland, 19th Century, stamped 800 "Jezler"and serial number on base, complete, height: 24.5 cm. Excellent condition. 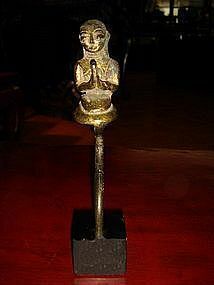 A solid Ebony Wood Carving from Bali, Indonesia, depicting the Goddess RANGA. Good condition. Hand carved, ca. 1940. Size: H. 36 cm. x W. 13 cm. x D. 6.5 cm. 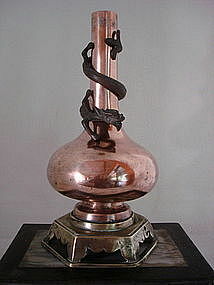 Exceptional copper vase with bronze coiled QILONG Dragon and stylized base. 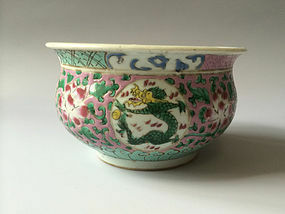 18-19th Century China. 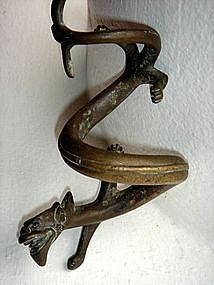 This most attractive Dragon is removable, has a stylized humanoid face, a fancy tail and the head has scales on top. 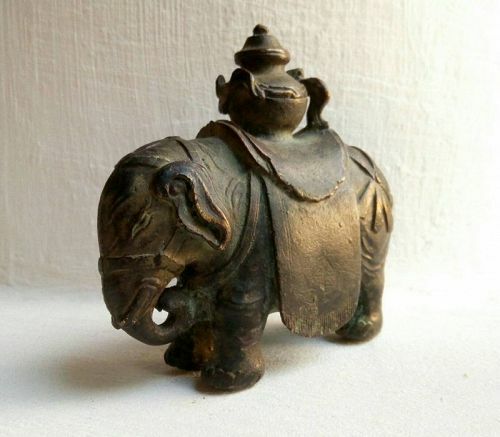 Good condition, Size: H. 31 cm x 15 cm base. For further close-up photographs of the Dragon please see our item # 574443. Could be made into a stunning lamp! 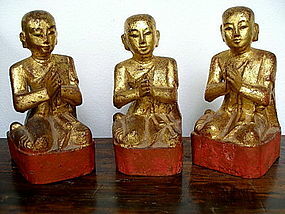 Rare find: set of three matching gilt wooden disciples-monks in adoration, 19th century, Burma, nice aged patina, excellent condition. 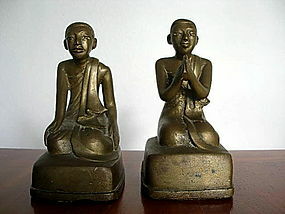 Size of each figure: H. 7.5" (19 cm.) 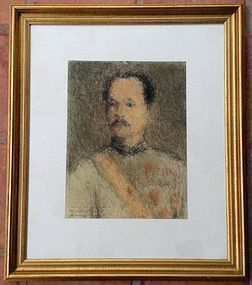 x W. 3.5" (9 cm.) at base x D. 4" (10 cm.) at base. 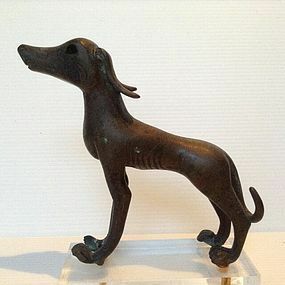 A very rare and impressive SOLID BRONZE WINDHOUND DOG SCULPTURE mounted on a base. Elegant and flowing features enhance this artistic sculpture of the hound. 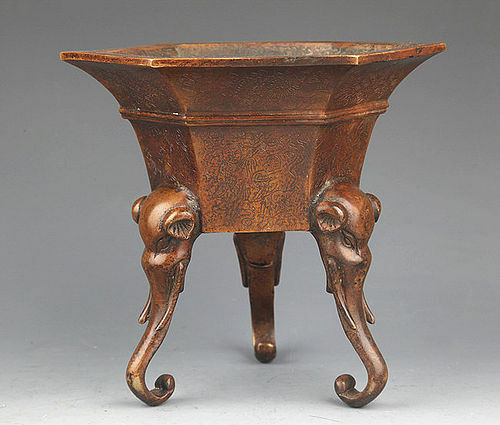 Naturally formed patina,19th Century. Good condition. Size: L. 13 cm. x H. 12 cm. x D. 3 cm. Weight: 413 gr. including plexiglass stand. 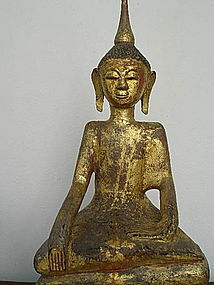 AVA BUDDHA'S Disciple / Attendant,Burma 17/18th Cent. 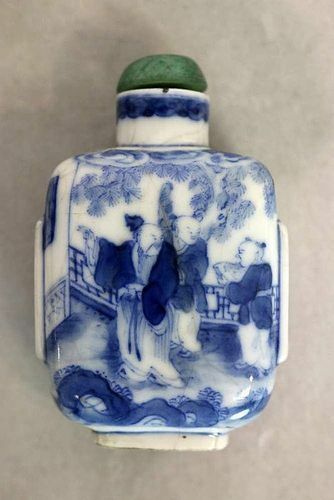 A very nice antique QING DYNASTY blue & white snuff bottle depicting 3 figures on a terrace surrounded by a garden with landscape on both sides. 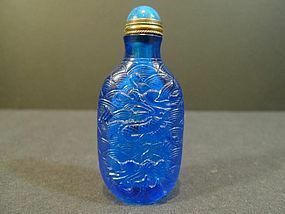 A raised rectangular area with flower decor can be found on both the right and left side of the snuff bottle.Comes with jadeite/jade stopper and spoon. 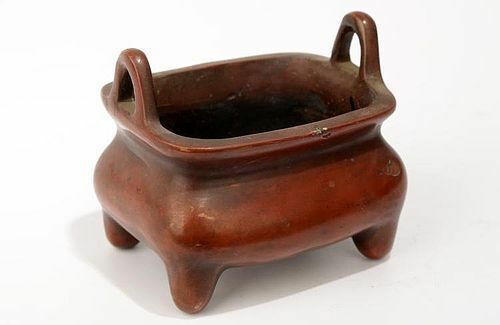 Chinese 4 (four) character marking on base. Good condition overall, normal wear considering age. Size: 7 cm. x 4 cm. 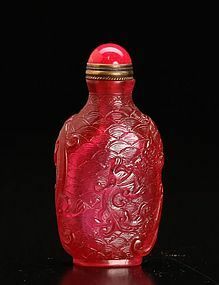 A very finely carved monochrome Ruby Red Peking Glass Snuff bottle with Stopper depicting Chilongs and Ruyi on both sides. Very nice specimen. Excellent condition, Size H. 2.875" x W. 1.5"